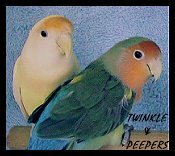 Peach-faced Lovebirds are dynamite in a small package! They have a somewhat independent nature with a reputation for being "nippy" at times. Nevertheless, they are sweet, adorable and fun to have as pets. Their chatter is neither loud nor unpleasant, making them a good choice in a home where noise is an issue. Lovebirds do not mix well with birds of other species as they are prone to bullying, and won't hesitate to inflict a nasty bite to the toes of an unsuspecting bird, even if the other bird is larger. These guys are fearless in spite of their small size! I would strongly advise against caging them with other birds. One of the cutest things to observe is nest preparation. Both the male and female will share the chore of shredding newspaper or other nesting material, but the female will take it upon herself to transport the bits of paper, which she carefully tucks into her wing and tail feathers, to the nest. She seems totally unconcerned that much of her "treasure" falls out along the way! Lovebirds can live up to 25 years with proper care and diet. 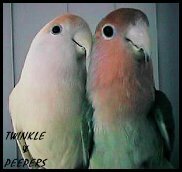 PEEPERS (hatched: 3/11/92) and TWINKLE (hatched: 10/07/92) are my Peach-faced Lovebirds. 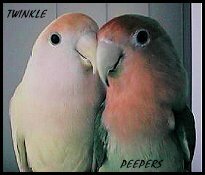 I brought Peepers home at 4 weeks of age, and Twinkle at a mere 10 days old. 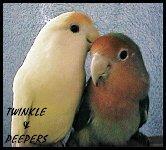 Peeps is a female "normal" Peach-face and Twinkle is a male "Creamino" Peach-face. He's just one of the many beautiful color mutations of Lovebirds that have evolved. Although they have attempted to set up housekeeping several times, they have never yet raised a family. I'm happy with that arrangement as I prefer they remain pets. These are two of the cutest, sweetest little dynamos on the planet! 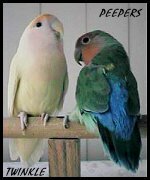 Peepers is a little more eager to be handled than Twinkle is, but I have never been bitten by either, which is contrary to the generalized notion that Lovebirds can be "nippy". I have heard that Lovebirds can and do talk, but neither of mine ever have. I think a talking Lovebird is a rarity. Regardless, my little guys are a pure pleasure to have around! !